Direct mail is still the one of the best ways to target specific people for specific products or services generating more sales. Other forms of advertising go with the “shotgun” approach often selling the wrong products/services to the wrong people. Direct mail is exactly that, direct. You can target exactly who would receive your message and what products/services they will most likely be interested in. We offer great mailer styles such as Tear & Seals, Postcards and Envelope Mailers. People are much more likely to open these mailers and pay attention to your message. What does digital printing mean? It means you can personalize each and every mailer that goes out with each person's name. You can target specific people with the right demographics for your products or services; you can even target a specific geography in order to draw people in to support a local store or branch. Need to bring back customers you’ve had in the past to upgrade products? Send out a mailer targeting them and that product. Have a weak location? Send out a targeted mailer in that area. Need to send out confidential information to shareholders, clients, class action lawsuits etc...our security mailers can be perfect for you. First Choice provides a full service Direct Mail program from Mailing lists to Design to Mailer Types to postage options. Need to bring back customers you’ve had in the past to upgrade products? Send out a mailer targeting them and that product. Have a struggling location? Send out a targeted mailer in the location's area. Need to send out confidential information to shareholders, clients, class action lawsuits etc...our mailers are perfect for you. Whatever your needs are First Choice can help you find the right direct mail program. We have our own in-house designer for the Tear and Seal and the Envelope stuffers that can provide you with changes as needed. You can also have as many information/data variables as you need for your mailer. 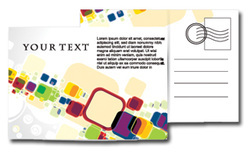 In addition, we have great graphic designers available for postcards that will give your mailer the professional look in order generate sales. We have access to a vast library of mailing lists that can include a wide array of information. You can target literally thousands of variables such as geography, age, income, gender, home ownership, hobbies, interests, and much more. We can find the right demographics so you can connect to the right consumer. The picture to the left depicts just one of dozens of styles. Bi-fold , tri-fold, address window, check styles and much more. We print many of these for clients who use them to advertise their products/services, offer rebate checks on certain in-store products or to send out important or sensitive information. It’s been very effective for many of our clients and the official look gets people to open the mailer to find out more. A colorful eye-catching postcard can draw the recipient's attention to pictures, messages and products or services your company may offer. Things such as discounts, announcements, sales or upcoming events can easily be displayed. Our Xerox iGen can produce rich, vibrant colors at one of the highest resolutions available giving your postcard the professional look and feel you need. ​Envelopes present a traditional professional appearance that everyone is accustomed to, and can include a formal letter which is sometimes the most desirable depending upon the message your company wants to convey. With 3 options to choose from you can pick the one that best suits your needs. They vary depending upon the speed of delivery and are priced accordingly. Generally, delivery times are most affected by distance, local being the shorter time period, cross-country being the longer period. First Class - This class gets your mailer to it’s destination in only 1-3 days, for those time sensitive mailers or if you just want your mailer to get there fast. Pre-sorted First Class - This class offers a reduced cost that gives you some savings but still gets your mailer to its destination in a reasonable time, usually 3-5 days. Pre-sorted Standard - This class gives you the greatest cost-effective savings but takes the longest, usually 5-7 days. This option is perfect for the cost conscious customer that does not mind waiting a bit longer for their mailer to arrive.